Not many SA-85 owners out there. 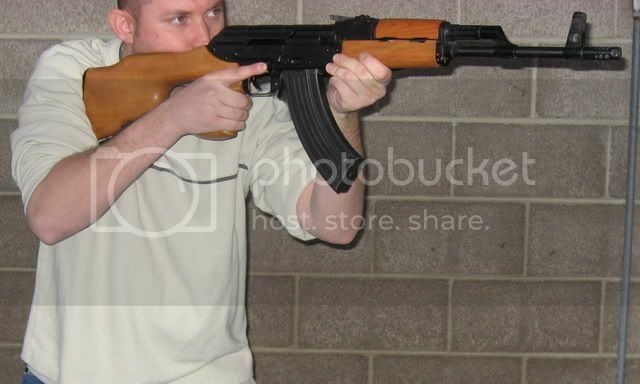 For those of us with one of the very best AK variants, post some pics. I wish everyday I could bring my issued rifle here to the states. Uhhh yeah..that's my war trophy......from my time in the hun army..
ETA- yes, it's a Romanian drum; I've got the original bayonet and three mags that came with it somewhere but I'm not sure where. Here's mine. Built on a NDS3 receiver by Troy Sellars at Inrange. Do you know where to get a pistol grip and buttstock like that? I have mixed feelings about the buttstock on mine. OK, I'll play...............gotta confess, I really love the Tapco SAW grip. It is waaaay more comfortable to fire. Looks good. The US flag is a nice touch. Mine is a work-in-progress, soon to have authentic stock and hand guards. It started life as a thumbhole, bought new in '95. Has about 100 rds through it. I found two SA85M pre-ban buttstocks here on the EE, plus a set of handguards. Any dealer handling the AMD 65 kits will be able to send you the correct FEG pistol grip, for which you'll need the ferrule and screw. The receiver already has the hole for the ferrule. Assuming I receive both stocks, I'll have an extra one. I would try Global Trades in Houston for the pistol grip. 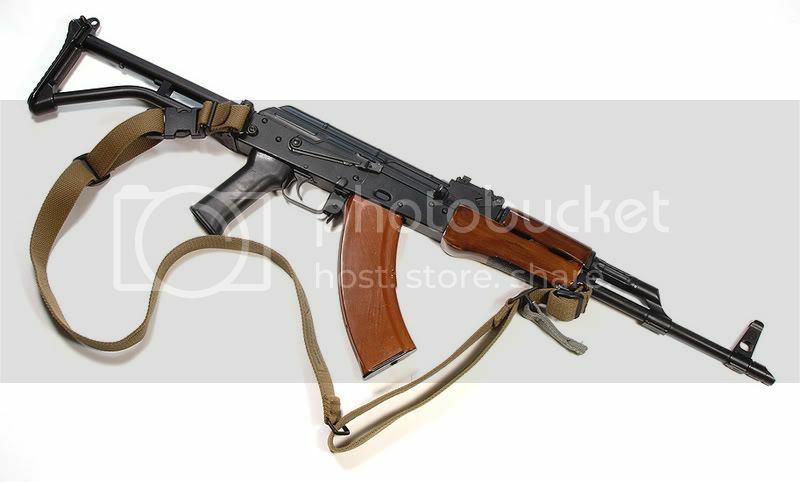 I do have a used SA-85 standard buttstock that I would sell. It shows some wear but is functional. Shoot me an email if you are interested. Here's mine. I bought it from CFS awhile back when the first came out. Its been put together for about a year and half. I just got around to refinishing it this weekend. Receiver is a Tapco flat, bent with the help of acmech from the GA Hometown forum, and his homemage jig. Finshed with Gunkote. The wood was in pretty good condition. I just used an Iron and damp towel to lift out the dings. Refinished with several coats of Tung oil. eeh it's ok. but honestly it aint worth NUTTIN if you don't ever SHOOT IT!!!! I know . . . this is my 5th one. I've shot #1, 3, 4. 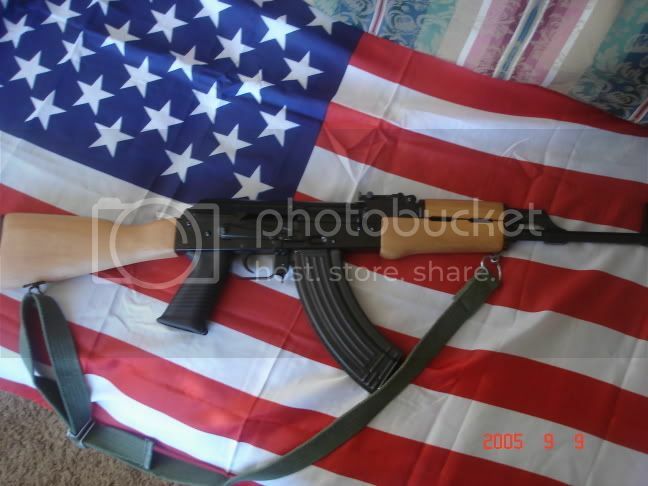 Still need to shoot the AK pistol and this one. So when are we going? Have you shot the Yugo under folder yet? I shot the yugo this weekend. However it didn't so so well. . When I put the center support in I made it to tight which hung up the bolt. I think I have fixed it so we can go again this Saturday! Plus I still don't have any of my compliance parts yet. . I am still waiting on them to be delivered!